The antibody was tested using immunoprecipitation against 5-Methyl Cytosine (5-MeC) and bromo-deoxyuridine (BrdU) or control (no antigen) and assayed by A-405 spectrophotometry. At a concentration of 25 µg/mL, this product demonstrates 8 fold higher reactivity against BrdU than 5-MeC. This product titers out at 50 ng/mL. For best results, use the product at a concentration of 25 to 100 µg/mL. Nearly complete immunoprecipitation was obtained at a concentration of 100 to 500 µg/mL. Our Abpromise guarantee covers the use of ab2284 in the following tested applications. IHC-Fr Use at an assay dependent dilution. Fixation in cold methanol for 30 minutes followed by immersion in 7 x 10-3 N NaOH for 10-15 seconds allows BrdU staining with the simultaneous detection of nuclear cytoplasmic and membrane assigns as well as preservation of morphological detail. ELISA Use at an assay dependent dilution. dilute from 1/500 to 1/40,000 against 1mg/mL BrdU analyte. IHC-FoFr 1/2000. 1/2000 (see Abreview). ab2284 staining BrdU in mouse intestine tissue sections by Immunohistochemistry (IHC-P - paraformaldehyde-fixed, paraffin-embedded sections). Tissue was fixed with formaldehyde and blocked with 1% H2O2 in methanol for 12 minutes; antigen retrieval was by heat mediation in 10mM citrate, pH6. Samples were incubated with primary antibody (1/100) for 24 hours at 4°C. ab2284 at 1/250 staining primary E12 mouse cortex cells by ICC/IF. The cells were paraformaldehyde fixed, blocked with serum and then incubated with the antibody for 24 hours. Streptavidin conjugated to Alexa-Fluor ® 488 was used as the secondary. 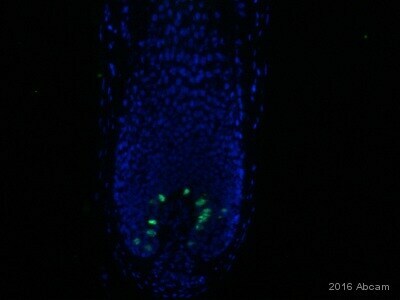 The image shows BrdU staining with nuclei counterstained with DAPI. ab2284 staining BrdU in Mouse skin tissue sections by Immunohistochemistry (IHC-Fr - frozen sections). Tissue was fixed with acetone and blocked with 10% serum for 30 minutes. Samples were incubated with primary antibody (1/50 in PBS) for 12 hours at 4°C. 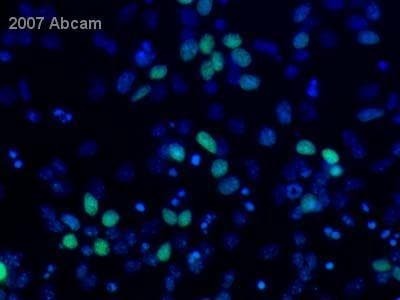 A Streptavidin Alexa Fluor® 488-conjugated Goat polyclonal (1/500) was used as the secondary antibody. ab2284 at 1/2000 dilution staining mouse free floating brain slices by Immunohistochemistry (Formalin/PFA fixed sections). The mice were treated with 100mg/kg BrdU 2 hours before fixation. 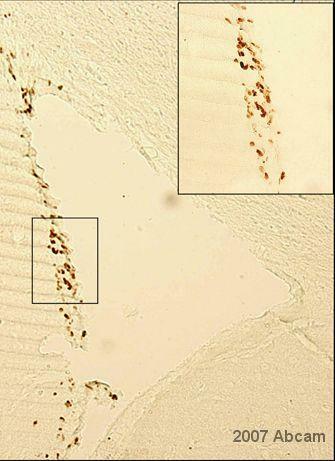 Free floating 40µm vibratome sections were obtained from paraformaldehyde fixed brains, these were incubated with the antibody for 24 hours. A streptavidin-HRP complex and DAB were used for detection. The image depicts the subventricular zone. Publishing research using ab2284? Please let us know so that we can cite the reference in this datasheet. May I put this antibody in -800C for storage? This antibody can be at -80C in aliquots for storage, and this may extend the life of the antibody. Either -20C or -80C will be fine. I use your protocol for BrdU staining. Please see attached file. 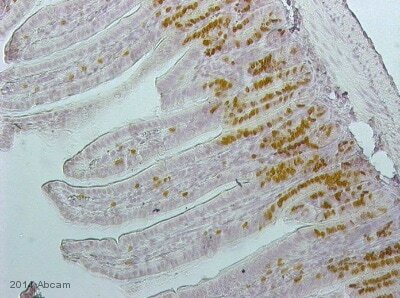 I used your antibody, ab2284 on mice intestine tissue last November, I got beautiful staining. This month, we are doing another batch of mice and following exactly protocol as November’s. I did three run of staining to exclude any mistake I might have and still got no stain at all. Finally, I thought it was DAB problem and emailed you last week. After receiving new DAB, I repeat BrdU stain with a fresh aliquated antibody. Then I got faint stain - comparing with last November’s staining. At that time, I thought it was Streaptavidin problem and emailed you for that. Since I need result quickly, I run another run with my real slides on Monday with the antibody I thawed last Thursday (got result on Friday) and got no stain at all even with new DAB. This antibody was aliquated and stored at -200C since we received last September. This particular tube was thawed last Thursday and used only once. It was put back to -200C right after usage. This Monday was the second time to thaw and to use, and I did not get any staining, the only explanation is that the antibody got degraded. I hope you agree with me or give me some suggestion. I also hope you could send me new antibody to see what I get. Thank you for your reply and forsending the additional information. It does sound like the antibody was damaged during storage, so I am happy to send a replacement vial for you. This will be coming free of charge on the order ***, which should arrive tomorrow. Please note that we recommend storing this antibody in working aliquots, so that each aliquot is not frozen and thawed more than one time. 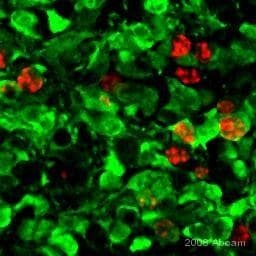 I apologize for the trouble with these products, but please keep me updated about how this replacement antibody works in your staining. Let me know if you have any questions or if there is anything else that we can do for you. We want to use the biotinylated anti-BrdU antibody without a secondary antibody. I was wondering if you would suggest blocking the tissue with hydrogen peroxide or denaturing the DNA with HCl first? You will denature the DNA first and then carry on with the IHC staining protocol. Do you know if somebody try to precipitate chromatin with BrdU antibody? Thank you for your question. I'm afraid as I have not done the experiments I don't have a recipe for the borate buffer. I find that IHC world (www.IHCworld.com) has often some good protocols, and the following link (http://www.ihcworld.com/_protocols/antibody_protocols/brdu_accurate_chem_sci.htm) mentions 0.1M Borate Buffer, pH 8.5 made with Sodium borate (MW 381.4) 3.8 g + Distilled water 100 ml. Indeed the Borate buffer is simply to neutralize the acid.